When something precious is taken away from you, Divine Providence enables compensation of significant magnitude. However, it takes a resilient spirit to recognise and embrace this ‘gift’ in the throes of adversity. For Jolene Dias, her life could have fallen apart when she was confronted with a seemingly insurmountable catastrophe, but for the support of her mother and her reliance on the power of God. Jolene began life as normal as any human could relatively be. At the age of fourteen she was dealt a devastating blow: she was diagnosed with muscular dystrophy. Before this she was an avid sportsperson, participating in football, tennikoit, badminton. She was learning Bharatanatyam too. It was a shock to her parents who had seen her as an active child. ‘Who would expect a person who was into sports and dancing to be handicapped at a later stage?’ says Jolene, who also suffers from ADHD. She is very demanding of love and attention from her family, friends and others, because of her condition. Music came to her rescue, acting as a saving grace. She had been training in music since the age of five. Till she was fifteen, Jolene underwent voice training. She continued learning the piano up to grade five through the Associated Board of Royal School of Music (ABRSM), but had to abandon her dream of attaining an ATCL qualification as the muscles in her fingers became weaker due to her medical condition. She has completed grade five of music theory and can play a host of instruments such as the guitar, the electronic keyboards, the keytar, the harmonium and the flute. Jolene has been trying to teach herself to play the violin. She says, ‘It’s quite exciting to hold a new instrument in your hands and experiment on your own.’ After teasing the violin strings for about two hours, she claims to have been able to play the hymn ‘All to Jesus, I Surrender’, to her own amazement. Thrilled by this immediate progress, she played her first piece of music on the violin for the Lord. Muscular dystrophy stunted her academic progress as this degenerative disease crippled her ability to stand for long hours. As a student of BSc, this was crucial for the purpose of completing practical work. Jolene thought it better to take up a Bachelor of Arts course instead. The disease once again had its way because she was required to move from one class to another to attend various lectures. She would become breathless when climbing the stairs. She tells us, ‘We requested the college authorities many times to hold the classes in a single class, but all our efforts were in vain...’ Hence, Jolene did not complete her bachelor’s degree. The Precious Jewels then became her next preoccupation. This group, comprising of singers, musicians and dancers, has been created on the lines of the musical troupes led by her idol, A R Rehman, and many other musicians. She says, ‘I believe that each and every person is talented and unique in their own way and so I decided on the name... Precious Jewels. Each of us is a precious jewel, uniquely and creatively created by God.’ The musical band is made up of an assortment of individuals. They are embraced for their talents and are not differentiated on the basis on colour, creed, class, age or whether they are differently abled or not. ‘God created us in his own likeness and image. Who are we to show preference for only a few and discard the rest?’ says Jolene. 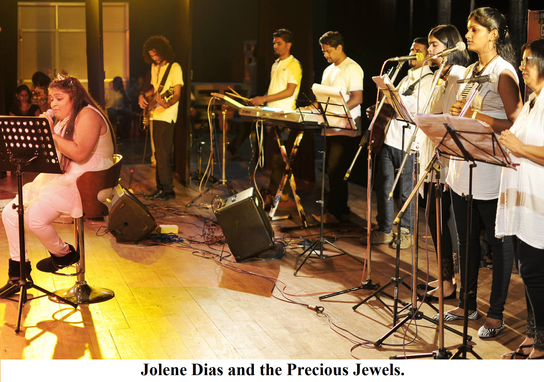 Tenacious as she is, Jolene was severely tested in the days following the formation of the Precious Jewels in July 2014. She was presented with the opportunity to perform at Spandan’s Art Festival. In the course of the two months of training prior to the festival, certain persons began to malign her and sought to break up her band. The pressure began mounting as Jolene tried to cope with training her band and battling the onslaught of calumny and mockery of her physical state, launched against her by means of the social media. To her dismay the musicians she had relied on began to move away from the band. The mood swings and depression she experienced took their toll in alienating her from some of the members in her group. But it was not time for her to face defeat. New musicians were recruited and the show went on. On a brighter note, she adds, ‘I am extremely grateful to the musicians who played for the show of Precious Jewels on 30th September. They are amazingly talented too. God bless them. I am planning to expand Precious Jewels by adding more singers and dancers and it is my desire that Precious Jewels travels around the globe.’ In doing so she hopes to inspire more people. Jolene has sung for two Konkani albums, one of which is Jezucho Mog Ek Vizmit by Bryan Fernandes. She has sung her own songs as well as a Malayalam number Olathumbathe Olanjanli. 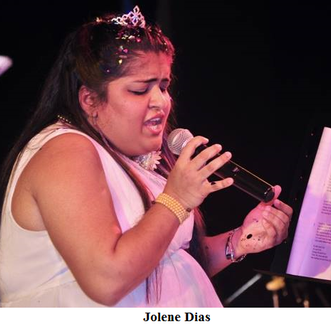 Thodi Alag Hoon, a Hindi single produced by Crescendo Music, is another song that has been sung by Jolene. She is known for her versatility when it comes to singing in a number of languages, European and Indian. She has made her mark as a music teacher with her students securing a distinction at the Trinity College London exams. Recently one of her students, Alicia Fernandes, was the highest at Trinity College at a global level. Jolene has great aspirations to work with A.R. Rahman and perform at MTV Coke Studio and MTV Unplugged. She desires to appear in famous magazines such as Woman’s Era, Femina, Elle and Vogue. Jolene’s mother has always been her shield and support, lifting her mood whenever she is down. Though she becomes angry with her Maker on occasion, she makes it a point to acknowledge the miracles he has wrought in her life. She still has her mobility although with some help. The doctors had predicted she would be confined to a wheelchair. In so many other ways God has worked wonders for her by providing a solution whenever she despaired.